A five star review in the RCSLT Bulletin by Ruth Hughes, Highly Specialist SLT, Dysfluency Clinical Lead; Marina Stubbs, Specialist SLT; Rebecca Richardson, Specialist SLT; Alison Smith, Specialist SLT; and Marie Newton, Highly Specialist SLT, Mainstream Schools Clinical Lead. In the journal Research for All: "Bronwyn viewed that the authors’ focus on treatment choices being directed simultaneously at parents and professionals, and the provocative writing style, could stimulate thoughtful discussion. In her view, professionals would benet from reading the book, through being exposed both to the arguments provided by proponents of treatments lacking evidence and the counterarguments that make good sense when considering the available research evidence. As such, this made the book unique and of great value to professionals. However, as a parent, Pat had deep reservations about its usefulness, even as a joint frame of reference in a therapeutic context. For her, the goal of addressing two vastly different audiences created problematic tensions, disrupting the book’s central purpose for both." "Whether it be Arrowsmith, psychological astrology or cows jumping over the moon, this book is here to help you navigate the minefields and discover the goldfields for helping students who truly need it most." "There should be a copy in every clinic." "Making Sense of Interventions for Children with Developmental Disorders ... has encouraged us to think about our setting and some of the unique opportunities that it provides for contributing to research and furthering the evidence base." "For the well rounded Educational and Developmental Psychologists, able to keep abreast of new research, much of what is outlined in this book will not be anything new. However, the thoroughness, brevity and clarity of the book is commendable, and the vast majority of the book presents useful and helpful content to aid and support our work, especially with respect to communicating our knowledge to the families we work with." 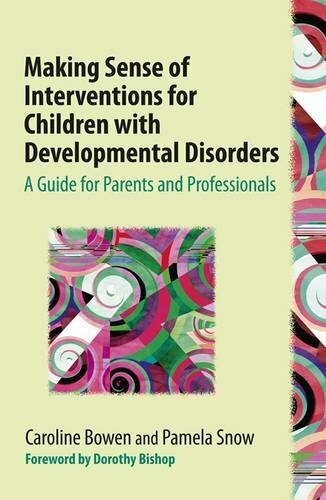 "This book should be made available to parents of children with developmental disorders via public libraries, as it has the potential to save them a lot of grief, time and money finding effective interventions, and avoiding ineffective ones.It would also be a valuable addition to paediatric and allied health professional libraries, and to the libraries of schools educating children with developmental disorders, which means most schools..."
"...an invaluable resource for teachers and parents...witty and erudite." "Although this book is relevant to my career (as a speech pathologist), I did not read it for work. Instead, I read it for entertainment. And it was indeed very entertaining!" "As a parent of a child with ASD, and as part of a family who works and has contact with children with disabilities on a regular basis, we are at the mercy of many a charlatan or well meaning group or individual who believe they have the answers. More often than not they don’t. If you are a parent or professional who is using a practice that is listed in the book as lacking evidence, this book is not an attempt to mock or belittle you choices. Rather a rational attempt to expose you to where the practice sits in terms of its efficacy to date. I endorse the point the authors make that those parents or professionals, who may support an intervention with little evidence, do not need to be belittled or made to feel gullible." "Incredibly detailed and understandable book. A must in any psychologist, occupational therapist or speech therapist's library. Don't get caught recommending shoddy unreliable treatments." "I found the book easy to read with information presented in digestible chunks with clear headings. As one would expect with a book dedicated to promoting evidence-based interventions, the conclusions are drawn from quality research, and the reference list is a resource in itself. Overall it provides a guide to becoming a critical consumer of the information presented to support interventions, of research, and of services delivering interventions." "There is so much to delight and intrigue in this book. So much crap to detect and so little time. Let me finish by saying this: “Buy this book.” In fact, buy two copies and give one to a friend. They’ll thank you for it." Non-evidence based, pseudoscientific interventions abound in the fields of education, psychology, medicine, alternative and complementary medicine (CAM), speech and language therapy / speech-language pathology, and allied professions. They range from costly diets and dietary supplements to alleviate speech problems, to spectacles with coloured lenses that cure dyslexia, to music CDs that boost academic performance and/or social connectedness, to weighted clothing to ameliorate the manifestations of autism and hyperactivity, to curricula devised to remediate specific learning difficulties, and more. These thrive alongside a raft of pseudoscientific exercise regimens and ‘cures’ for apraxia, ADHD, autism, (C)APD, articulation disorders, dyslexia, stammering (stuttering), voice disorders and behaviours of concern, as well as remedies for a number of ‘made-up’ and/or contested conditions such as Functional Disconnection Disorder, Retained Neonatal Reflexes, Sensory Integration Disorder and Irlen Syndrome. Typically, pseudoscientific interventions are marketed, spruiked and talked-up to parents and professionals, including teachers, speech-language pathologists (SLPs) / speech and language therapists (SLTs), occupational therapists (OTs), psychologists and allied health professionals (AHPs), often with fulsome testimonials, and without a scrap of evidence. Sometimes, professionals themselves get caught up in these undeniably popular interventions and fail to adequately critique the 'evidence' behind such approaches. The hype surrounding fads is persuasive, the advertising seductive, the lure of the quick fix often irresistible, and the endorsements and testimonials emotive and plausible – often playing to a parent’s insecurities, anxiety and guilt over their child’s predicament. Among those who are not quite convinced about the benefits, there are even those who purchase them on an it-might-work-and-it-can’t hurt basis. After all, what parent would not want to give their child every possible chance of success? You can follow Making Sense of Interventions for Children with Developmental Disorders on Twitter.